Dumpster diving is the practice of going through commercial dumpsters to find items that have been thrown away, but more often than not, are still useful. It can also be called urban foraging, curb shopping, alley surfing, or just recycling. Due to the economic times, this practice is becoming a nationwide phenomenon. One of my favorite blogs is These Days in French Life. Riana has been dumpster diving for years. She finds food, toys for her daughter, tools and building materials for her home. It’s part of her “slow” non-consumer life. Last night we watched a segment on the local CBS news about a woman in Berkeley who dumpster dives behind the better grocery stores and gets wonderful hearth breads, fruits and vegetables. Today, Mr. Recession Kitchen came back from the lumberyard with two flats of plants. He said that the lumberyard had put in a garden section but apparently it wasn’t doing well so they were discontinuing it. The salesperson was throwing all the remaining plants in the dumpster. He asked if he could take them some and she said it was fine. Then more customers started taking the plants and they realized how ridiculous it was to be throwing them away so they left them outside dumpster. The plants Mr Recession Kitchen brought home were root bound and somewhat shabby for the most part, but they just needed a little TLC and some water. I rounded up all of the empty pots I could find and a big bucket of my lovely, wormy compost and got to work. The first thing I transplanted were the begonias. Eight of them went into this pot and six others went into one of my shade beds. Begonia’s don’t like to much direct sun. 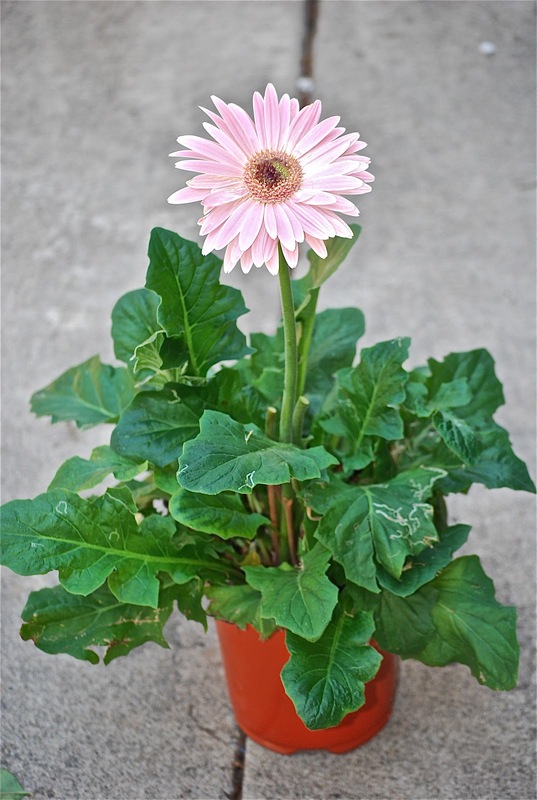 This Gerber daisy was in very good shape, it went into a planter with some giant dark pink zinnias. 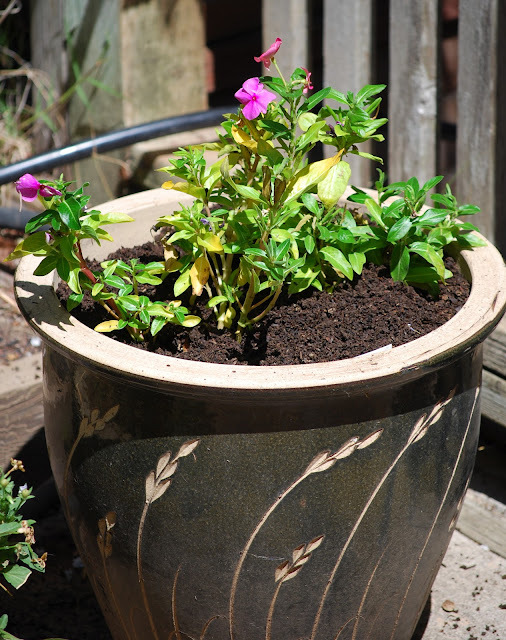 Next I planted two Vincas in this pot. beds. They like to spread, so I’m hoping they will hang down and cover the concrete walls of the bed. I also got a scarlet Dahlia and two purple trailing Lantana. I love Lantana, I’m not sure where I’m going to put them yet. There were six of these moss roses, which I love. I put them next to the one I already had in this chicken pot. The bonus is that I also got this wonderful tray and pot set that I intend to use to start my tomatoes, squash and other plants next spring. I think dumpster diving behind the nurseries will be a new hobby. Of course the garden supervisor kept a watchful eye on everything I was planting. Pest control was MIA.